The more I played of Jotun, pronounced Yo-tun, the more the game confirmed what I had thought in the first few hours: this is a special, incredible game. A mix of exploration and action, Jotun tells the story of Thora, a Norse warrior who suffers the ultimate insult: she dies an inglorious death. Since that is unacceptable in the Viking world, Thora is placed in a sort of “Viking limbo” to impress the gods and gain entry into Valhalla. To do this, Thora is tasked with defeating Jotun, giant representations of the elements. With nothing but an axe, Thora sets off to defeat the Jotun and finally rest in the glorious afterlife. Gameplay in Jotun revolves around two main mechanics: exploration, and enormous boss fights. Exploration in Jotun is both wondrous and challenging. Each level focuses on a specific Jotun, and each Jotun needs two ruins to be found before they can be summoned. 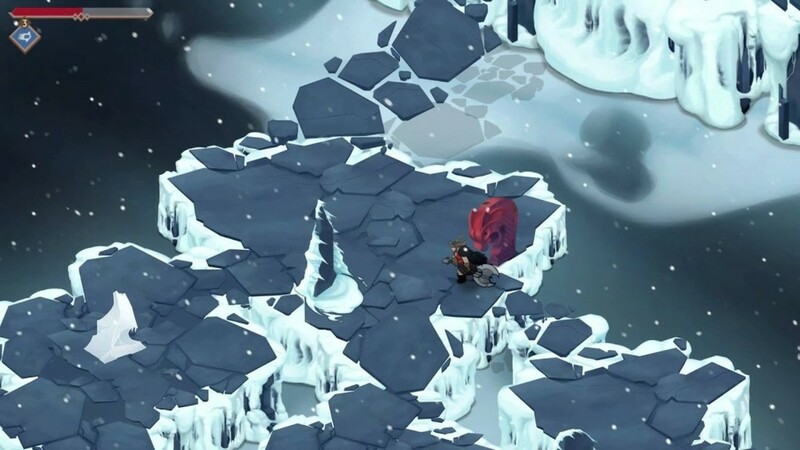 To do this, Thora must travel to two different lands, each in the theme of the Jotun you’re looking to challenge: fire, ice, earth, grass, etc. In these exploration-based levels, you’re free to roam around as Thora, who moves like a heavy-set Viking, slowly exploring through these levels. However, it never feels like she’s moving too slow, somehow always feeling like she's going the appropriate speed. The same goes for her two attacks, a light and heavy strike, that both feel properly weighted and heavy. Each of Thora’s movements are deliberate, and learning that is important to controlling her. Aside from exploring the beautifully hand-drawn levels as Thora and finding ruins, you also have the option to find shrines and golden apples. These items aren’t necessary but considering that the former gives you new abilities and the latter gives you extra health, I highly recommend you spend some time finding them in each level. These abilities come in handy when you decide to take on the third and final level of each realm, which are the fights against the Jotun themselves, who are merciless and enormous. Each boss battle feels like a new, fresh experience that has you learning tells, watching carefully, and hoping for that lucky hit at the last second. 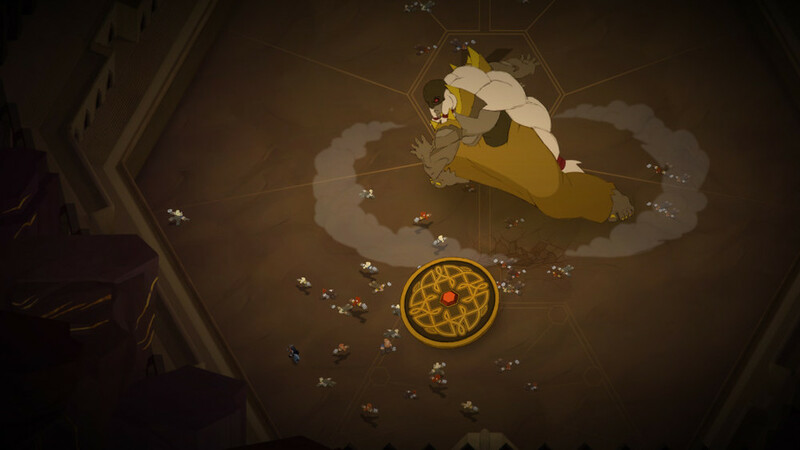 Jotun’s boss battles are the epitome of “tough but fair”. Much like a 90s platformer, I knew from the start of a fight that I stood no chance of succeeding if I made one wrong move or faltered slightly early on. Jotun doesn’t demand pixel-perfect movements, but it does demand you to know what to do and when to do it. Bosses are absolutely giant, and it provides a great feeling of scale when you come up against one. Thora’s deliberate movements play a big role in these fights as it’s imperative that you know when to dodge, when to attack, and when to just run. Getting a heavy strike in on a Jotun and running back becomes a typical strategy, but I never found myself feeling like I was doing the same thing over and over. That’s because Jotun wisely switches up each boss fights even as the battle goes on, evolving them and making all the fights feel unique. Jotun typically have three or four moves they’ll pull out, but as the fight goes on they pull out their more aggressive moves more often, making you switch strategies on the fly. I died a lot in Jotun, but I never felt like it wasn’t my fault. I knew what I did wrong, and I did it better the next time. I can’t praise the art in Jotun enough as it kept me awestruck throughout the entire game. From the moment you arrive in purgatory, you’re treated to a breathtaking view of the level you’re about to explore and it becomes a reason to pause once you see it. From there, the shifting art style that changes with each Jotun’s world to match their element kept me engaged. Whether I was sliding down the roots of Yggdrasil, hiding behind rocks to avoid a blizzard’s winds, or exploring the ruins of a Dwarven city I was always amazed by the colors and art around me. That’s because Jotun has a unique, hand-drawn art style that is not unlike another Viking-esque tale, The Banner Saga. Gamers who have played that title will see some of the similarities in the art, though Jotun has a much more cartoon-like look to it when it comes to its exaggerated bosses and colorful worlds. I really can’t say enough about how beautiful this game is, it’s something you need to experience for yourself. When I took down my first Jotun I felt accomplished, much like taking down a boss in Bloodborne or Dark Souls. The game’s simple controls, beautiful visuals, and exciting boss battles keep the game moving while still feeling fresh and exciting at each turn. The fact that the game is completely voiced in Old Norse, or something close to it, just adds to the authenticity that the game already oozes out. Jotun makes a strong impact early on and the hits keep rolling as the game lurches forward with each heavy axe swing. Out of all the games I’ve played this year, Jotun was the biggest surprise and it’s one I can’t recommend enough to fellow gamers. Make sure you don’t miss this one this year. Once you get past the odd control timing I think anyone can really enjoy Full Bore. The world feels unique and fresh while the gameplay feels familiar enough to be comfortable, but different enough to feel innovative. While some parts of the game can be frustrating, it always gives you a close by checkpoint to make sure your progress is never truly lost. Besides, once you get into the game and see that little boar banging its head against an unbreakable block you’ll fall in love and want to see where this little boar is going to go. Every element is passable, but the memorable moments all come from artistic achievements, not strong gameplay design.